A total of 217,000 people visited the Cairo International Book Fair in the first two days since it opened, the head of the Egyptian General Authority for Books, Haitham El-Hag, said on Friday. The fiftieth edition of the fair is taking place for the first time in New Cairo, a wealthy suburb of the city. It was previously located at the Nasr City fairground. 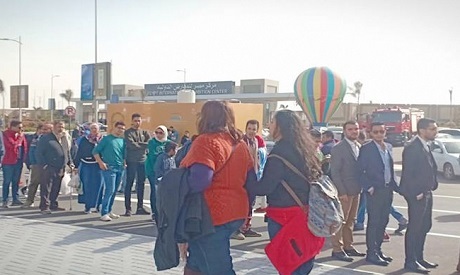 El-Hag said that the attendees included children, young people, families, Arab guests and foreign students studying in Egypt, adding that visitors committed to queues and regulations, reflecting positive reactions to the exhibition at its new headquarters. He encouraged citizens to visit the fair and participate in the special golden jubilee edition. Egyptian President Abdel-Fattah El-Sisi opened the event on Tuesday. The two-week event brings together 1,724 publishers, with participants from 35 countries, including those from Kenya, Nigeria and Ghana taking part for the first time, state news agency MENA said. Around ten African countries, 16 Asian countries, seven countries from Europe, and two from the Americas are participating. A total of 749 publishing houses are participating in the fair, with 579 houses from Egypt alone and 170 foreign houses. A total of 580 volunteers have been assigned to assist guests. The fair commemorates this year former Egyptian culture minister Tharwat Okasha, the brains behind the event, and author Suhair Al-Kalamawy, the first head of the General Egyptian Book Organisation. The event, which opened to the general public on Wednesday and runs through 5 February, will feature hundreds of side events dedicated to culture, arts and children, as well as eight workshops on writing, theatre and fine art. It will host around 170 Arab and foreign guests, as well as over 300 poets and 2,500 writers, critics and artists. This year's edition is being held in Egypt's International Exhibition Center in New Cairo.